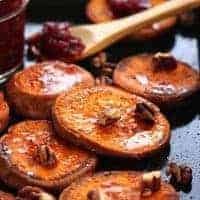 Roasted sweet potato rounds are perfect for the holidays or anytime you need an easy snack, side dish, or appetizer. 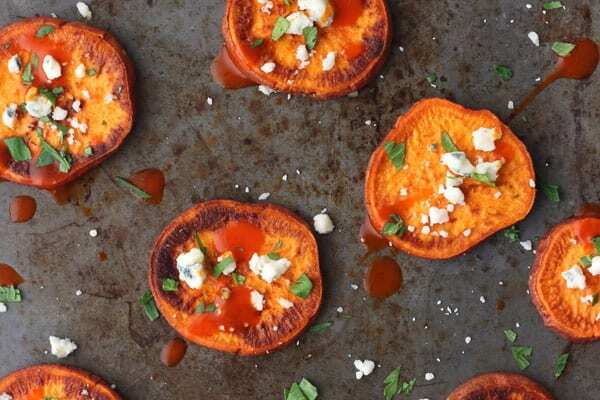 They’re sweet potato slices seasoned with coconut oil, salt and cinnamon then roasted to caramelized perfection. Better make two batches, you won’t want to share! Scroll past the recipe for 10 more irresistible topping ideas. Life Changing, Unbelievably Easy, Ridiculously Delicious, Perfect for Any Occasion Roasted Sweet Potato Rounds. That was the original title of this recipe. But it’s kind of a mouthful. 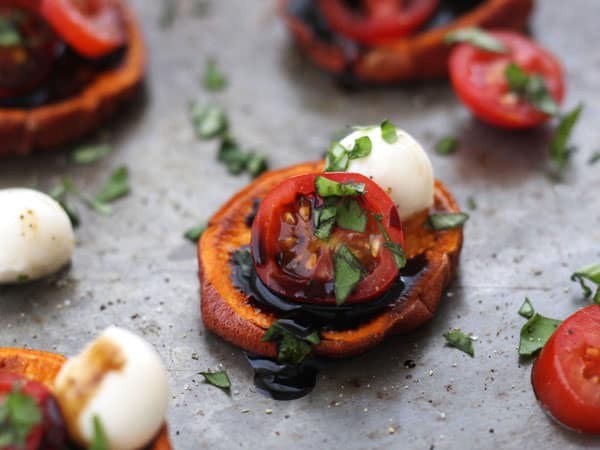 With recipes like chip-free sweet potato nachos and vegan twice-baked sweet potatoes with pineapple and coconut, you guys know we L-O-V-E baked sweet potatoes. And, I know you heart them too. 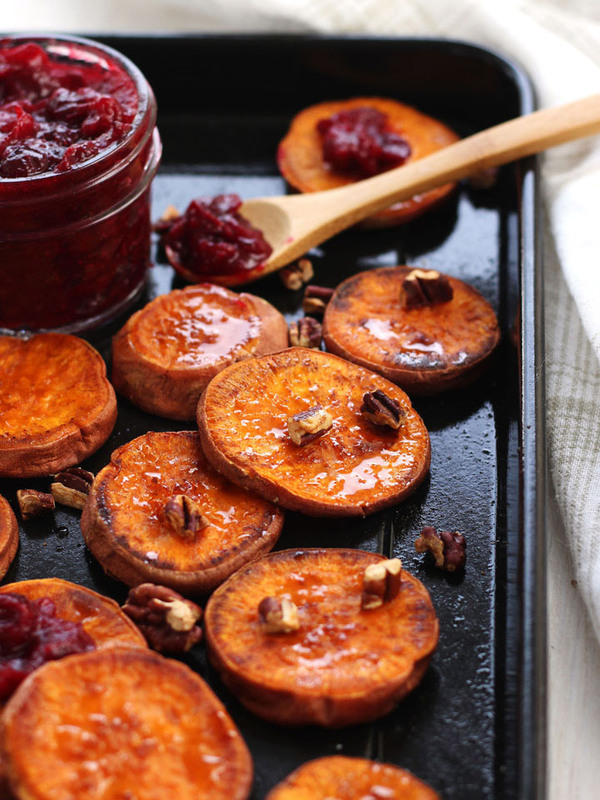 Baking a whole sweet potato takes forever…Okay, so maybe it’s more like an hour. But you know what I’m talking about. When you’re waiting for something you crave, it feels like an eternity before you’ll get to dive into that fluffy baked sweet potato. 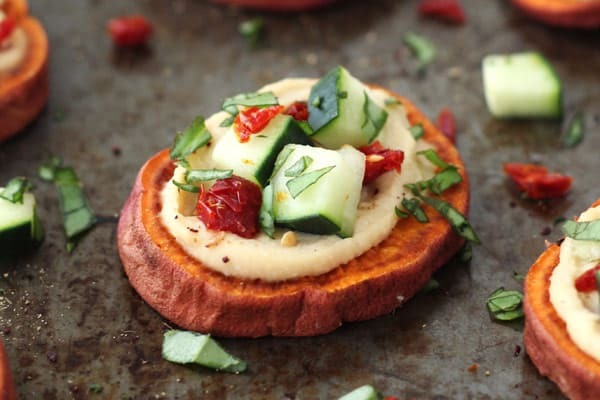 That’s why you’re going to LOVE these tasty roasted sweet potato rounds. They’re crispy on the outside – creamy on the inside and take just 30 minutes to make! Are They Really That Easy? Yep! For plain rounds, it’s basically Slice, Oil, Roast and Eat. We’ve included helpful tips in the notes section (and topping ideas after the recipe) but it really is that simple. I gave this batch a “Thanksgiving Leftovers” treatment with a drizzle of real maple syrup, some of our balsamic roasted cranberries and a few toasted pecan pieces. They were so yummy, I’m not even ashamed to admit polishing off the whole pan All By Myself! But I’m pretty sure you could top them with anything in your fridge or pantry and they’ll be equally irresistible. 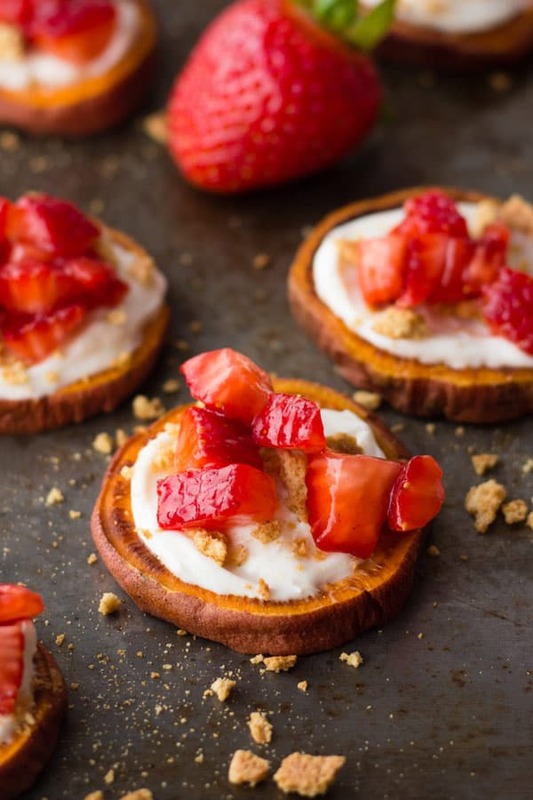 These irresistible sweet potato rounds are crispy on the outside, creamy on the inside and so easy to make with your toaster oven. Adjust your toaster oven (or oven) cooking rack to the lowest placement and preheat to 425°F. Slice the sweet potatoes into ½-inch rounds. 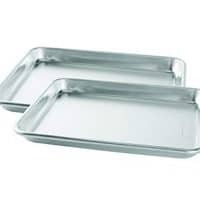 Place rounds on a roasting pan or rimmed cookie sheet. 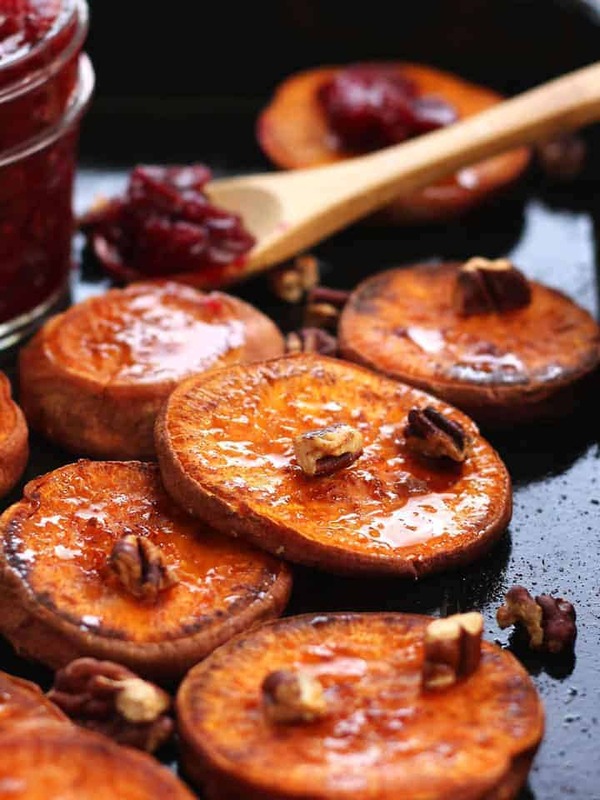 Brush each sweet potato slice with oil and sprinkle with cinnamon and salt. Flip slices over and repeat. 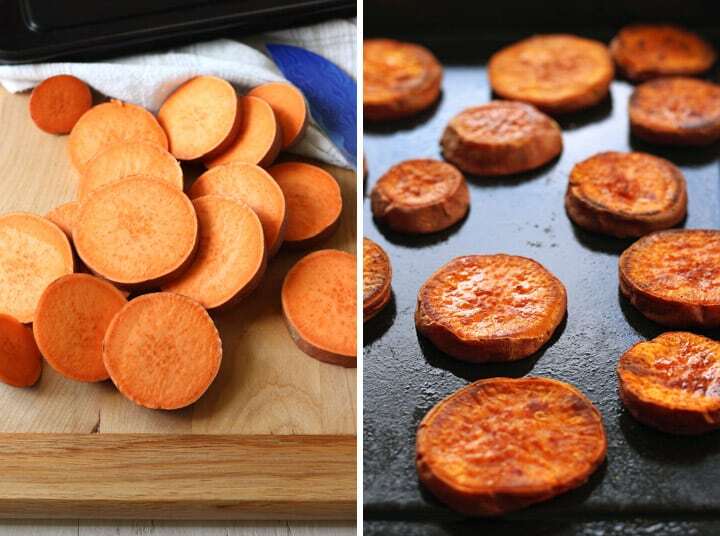 Roast sweet potato slices for 10 minutes. Remove the pan and carefully flip the rounds with a fork or spatula. 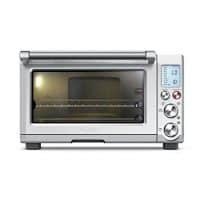 Return to the toaster oven (or oven) and cook for an additional 8 to 10 minutes until golden and caramelized. Serve rounds plain or with your favorite toppings. For the best rounds look for thinner sweet potatoes that are an even width. Have fun and experiment with different seasonings and toppings. Try olive oil with chipotle powder or garlic salt for a more savory snack. 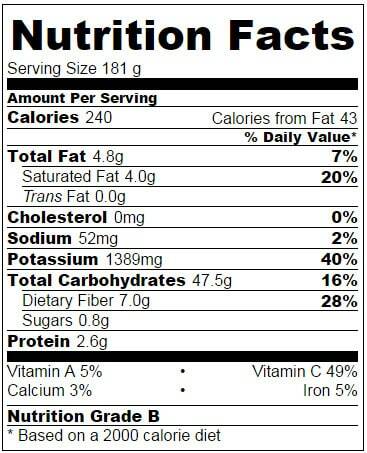 Nutritional information is an estimate for 1 of 2 servings without any toppings. *For all of the variations below, omit the cinnamon used in the original recipe. 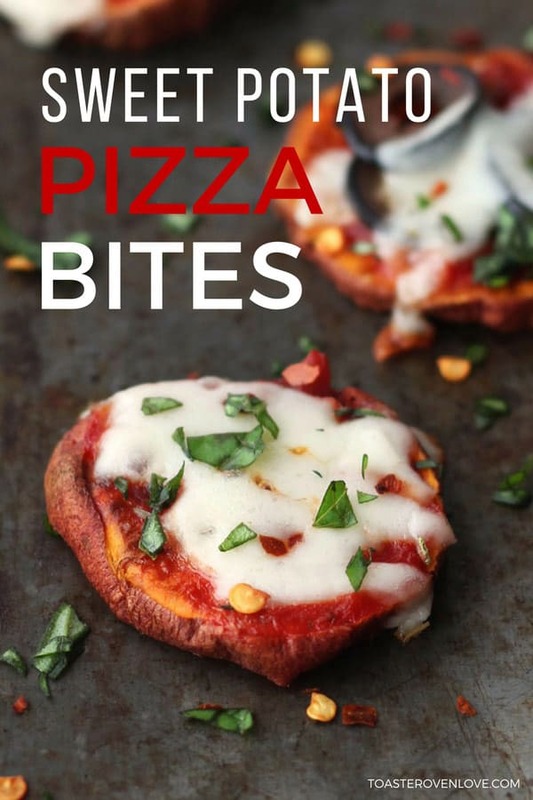 Pizza Bites: Use olive oil in place of the coconut oil in the roasted sweet potato rounds recipe. Spread cooked rounds with pizza sauce, shredded mozzarella cheese, and sliced olives. Broil for 1-2 minutes until the cheese is melted and bubbly. Sprinkle with fresh basil and red pepper flakes. Strawberry Cheesecake: Spread slices with a mixture of 2 ounces softened light cream cheese, 1 tablespoon Greek yogurt, 2 teaspoons honey and 1/8 teaspoon vanilla. Top with 1/4 cup chopped strawberries and half a sheet of graham cracker, crushed. Cucumber Hummus: Top slices with hummus, diced cucumber, chopped sun-dried tomatoes, a sprinkle of Za’atar and fresh basil. 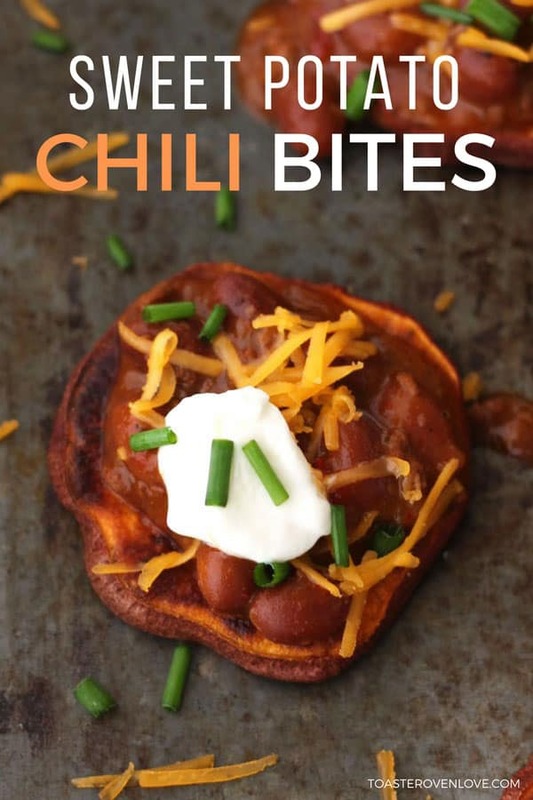 Loaded Chili Cheese: Generously top slices with 1/2 cup of vegetarian chili. Sprinkle with shredded cheddar cheese, small dollops of plain Greek yogurt and chopped chives or green onions. 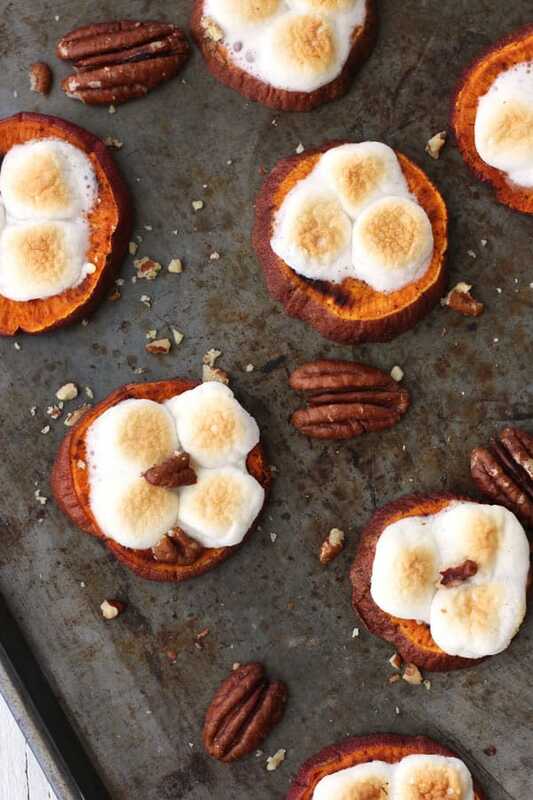 Sweet Potato Casserole: Top baked sweet potato slices with mini marshmallows and broil for 1 minute until puffed and lightly browned. Sprinkle with cinnamon and toasted pecans. For an epic Thanksgiving S’more sandwich one between two graham crackers. Sweet and Tangy Caprese: Top rounds with mini mozzarella balls, sliced grape tomatoes, torn fresh basil and a drizzle of balsamic glaze. 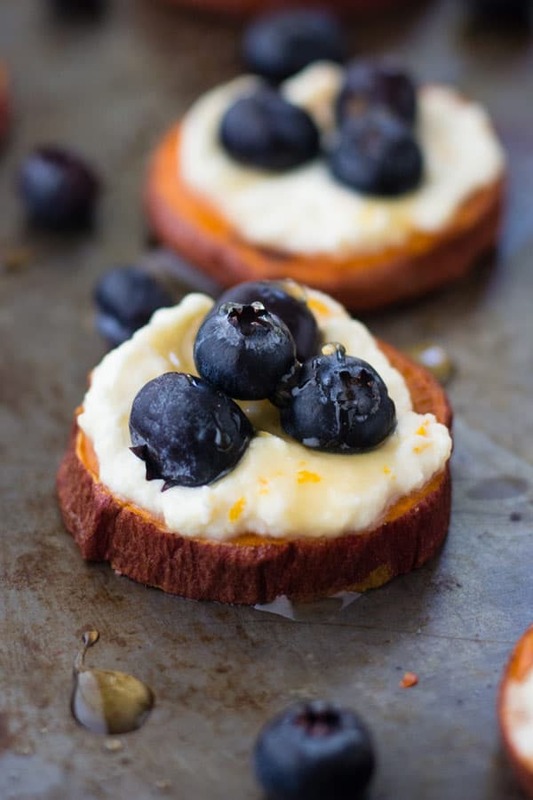 Creamy Blueberry Ricotta: Spread slices with a mixture of 1/4 cup ricotta cheese and 1/4 teaspoon orange zest. Top with 1/3 cup fresh blueberries and a drizzle of honey or maple syrup. 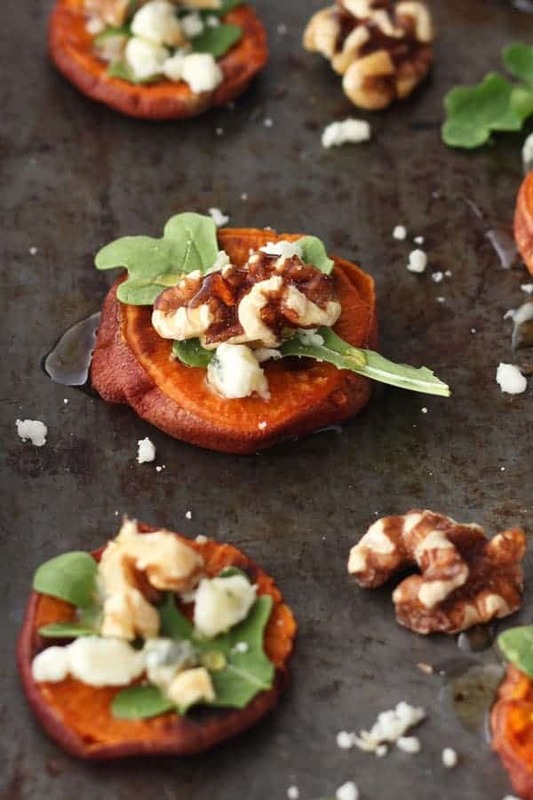 Walnut Blue Cheese: Top roasted rounds with fresh baby arugula, crumbled blue cheese, chopped or whole walnuts and a drizzle of honey. 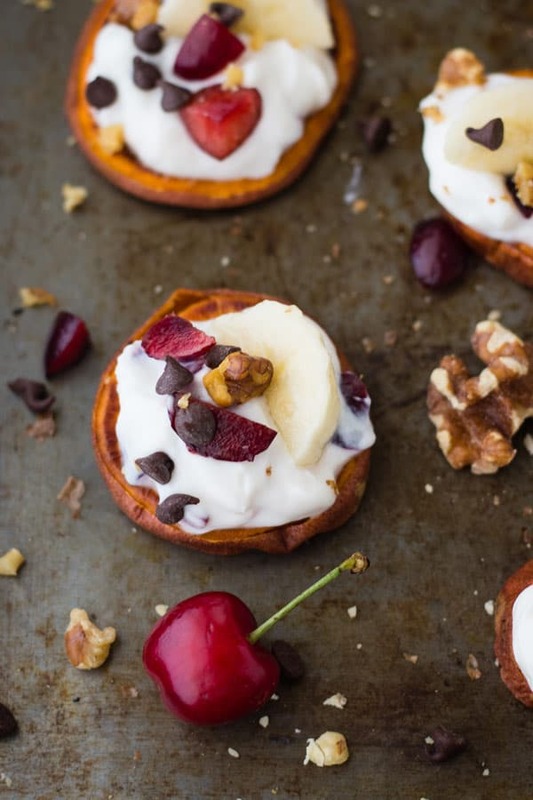 Cherry Banana Split: Dollop a mixture of 1/4 cup vanilla Greek yogurt mixed with 3 tablespoons chopped cherries onto each baked sweet potato slice. Top with banana slices and mini chocolate chips. Buffalo Blue Cheese: Substitute 2 teaspoons olive oil mixed with 2 teaspoons buffalo sauce for the coconut oil in the original recipe. Top cooked rounds with crumbled blue cheese and finely chopped celery leaves. Drizzle with more buffalo sauce before serving. My husband likes his sweet potatoes topped with butter, drizzled honey and McCormicks GrillMates Smokehouse Maple sprinkled on top! Thank You, Peggy, you’re the sweetest! Best wishes for a delicious and fun start to 2018 for both you and Dell! Crazy yummy! I did a trial run on these as a New Years appitizer. They were so good plain that I’m going to have a hard time putting anything on them. How are they cold. I’d like to make ahead so as to spend more time with guests. You’re so smart to plan ahead, then you can party and mingle instead of being stuck in the kitchen. Way more fun for you and your guests! You can totally make the rounds ahead of time, they reheat well and taste good at room temperature too. This year, we made 3 batches (with just oil and sea salt!) the day before our family’s Christmas Eve potluck. I under-cooked the rounds by about 2 minutes, cooled and bagged them. Then, before the party we popped them in a 425F oven for a few minutes to warm and re-crisp a little. They cooled down after we set them out and everyone still enjoyed them! I hope you have a fabulous party, Happy (early) New Year! These look like the perfect side dish! I’m definitely trying this soon, especially since I love cinnamon. Thanks for sharing! I have just made the sweet potatoes for lunch today. They are sooooooooooooo good!!! I spiced them with garlic powder and chili and didn’t brush them, but mix them in a bowl with the spices and coconut oil before baking them. I am sure I will make them again and again. 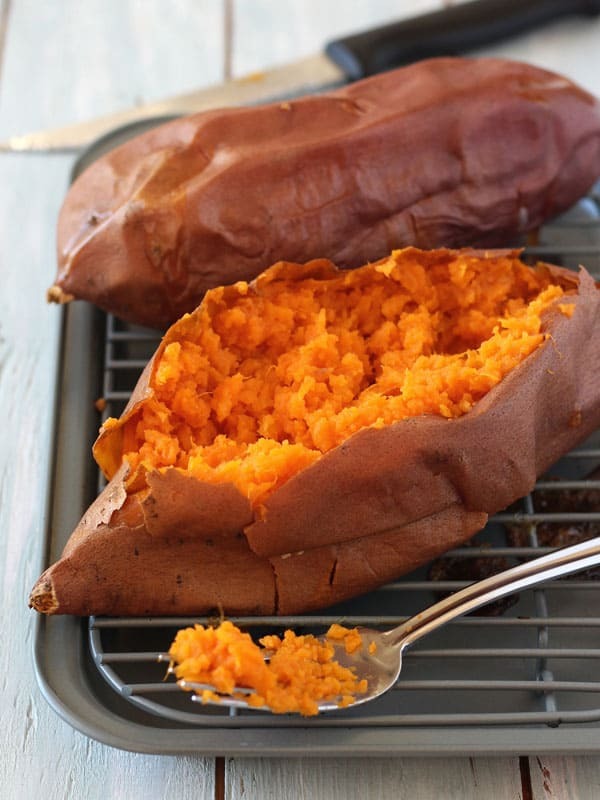 These sweet potatoes really look amazing! Beautiful pictures! I am sure I will make them.